there are a few outfits and pieces of clothing that i have always desired to have and to sport*. 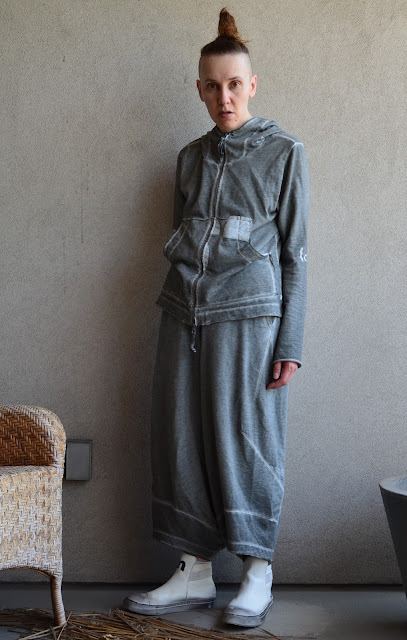 a pair of grey sweat pants and a grey sweat shirt (be it a pullover or a hoodie) -- a grey sweat suit -- have/has been on my wish list pretty much since i became "clothing conscious" (around the time that i turned ten years old). now, with this rundholz black label rendition of the grey sweat suit, i can check that item off my wish list. hurray! now on to the next item: the white t-shirt and jeans combo. *accidental pun ... which will become obvious with the next sentence. i am wearing rundholz black label s/s 2016 (t-shirt, hoodie, trousers and shoes).